The new(er) magic lantern focus stacking seems pretty straight forward to me, except setting the steps per picture. I understand this will depend on the specific lens used, but I can find no info helping with that. I have a EF100mm/2.8 macro and a EF24-105/4 both L IS USM lens that can work with this. Is there any info available that given a desired range of focus distances I can use to select appropriate step sizes for these lenses? Is the step distance going to be constant regardless of focus distance? I suppose one might have to set up some tests with a scale and run some test stack at different distances to get this information if it's not available somewhere. I would expect with these popular lens that info ought to be around somewhere already. I should add my body is a 50D. Well I tested it with a ruler and the 100mm. I got 10 images in 0.45" at close focus with focus step /image =1, but it was about 2x off at a longer focus distance. I assume this means the step size is not constant with focus distance. This may be OK for landscape focus stacking but maybe not so much macro. Does non-uniform step size mess up synthetic stereo creation in Zerene? I got 10 images in 0.45" at close focus with focus step /image =1, but it was about 2x off at a longer focus distance. I assume this means the step size is not constant with focus distance. I have always suspected that the steps are uniform in image space, analogous to turning a focusing helicoid by fixed increments. That would make life a lot simpler for the auto-focus mechanism, which has to decide what to tell the lens based on what the AF sensor sees. Of course steps that are uniform in image space are not uniform in object space. But it's probably not too far off uniform if you're stacking over a fairly short depth, typical of higher mag situations where you might be using synthetic stereo. In any case, this probably doesn't matter because of the reason explained next. Zerene Stacker assumes that the steps are uniform in image space. To the extent that they are not, there will be some distortion of apparent depth. I expect this might be detectable in careful work if you tried to use photogrammetry to recover measurements from a synthetic pair, using the faulty assumption that it's a real pair. But I have not seen a case where any distortion was commented about by a human viewer. Most relevant to your question, and if I'm thinking correctly about this, assuming uniform steps in image space gives a result that is almost identical to what you'd get with true stereo. I have not worked through all the details, and I'm guessing there would be some approximation due to image rescaling, but I think the difference from exact would be small in most cases. As an illustration/crosscheck, consider this misbegotten bit of synthetic stereo that I just now generated. The underlying stack was captured several years ago using Magic Lantern, driving the 18-55 mm kit lens on a Canon T1i at f/11 and 27 mm. It's really sort of crazy to even attempt rendering this stack as synthetic stereo, considering that it was shot with an aperture that was a whopping 2.5 mm wide (=27/11). This is a total of 32 frames, with a focus step in object space that ranges from a small fraction of an inch in the foreground to many feet in the background. Despite the insanely small physical aperture, I've rendered this with +=2% shifts, resulting in something that to my eye looks shockingly good compared to the junk that I was expecting. 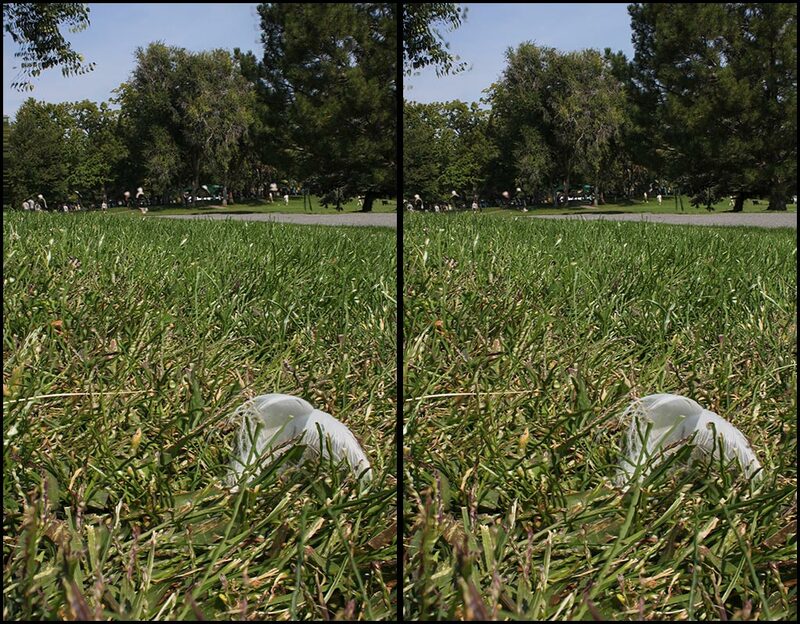 There are a lot of motion and other artifacts, some of which cause floating ghosts in the background, but I think the overall impression of depth comes through remarkably well, and the same as what true stereo of the same scene would be. Yes the foreground stereo looks fine. Behind the path I can't see any depth though. The foreground tree on the right looks flat with the background trees on the left. This makes sense if the background step is much larger, or if the stack ended before collecting multiple images at that depth. Seems like for most viewing purposes the non-uniform step size does not damage the stereo effect noticeably. My biggest concern is computing how many images are needed vs the step specified in ML (1-10 are the choices now). It's very different from your ML stacking FAQ again. One solution is to specify many more shots than you know you'll need to capture the full depth. If you watch as it progresses you can see when you have more than enough and press the menu button to stop it. I did a few stacks with the smallest step size and looking at the images it seems there is not enough overlap (100mm @ f2. . This means there is also the issue that there is an aperture size limit that if exceeded could give focus banding. The example I did seemed OK after stacking even though the overlap looked a bit shy in the individual images. I'll post that result in the studio gallery shortly. I think the biggest shortcoming with ML is documentation. Seems like you have to run experiments to reverse engineer how anything works. The foreground tree on the right looks flat with the background trees on the left. This makes sense if the background step is much larger, or if the stack ended before collecting multiple images at that depth. It also makes sense if all those trees are far enough away that they appear best focused in the same source frame, which is the case here. At f/11 and 27 mm, everything from roughly 10 m out to infinity is equally well focused (within 1/4 lambda wavefront error). I have not revisited the ML interface recently. The general process used to be 1) choose step size, 2) fly to end and mark that, 3) fly to beginning, 4) ML automatically figures out how many frames based on start/end and step size. Have they changed that general process? ML now has you set how many images ahead of the initial focus and how many after as well as the step size (1-10 of unknown units). It computes how many images that is and runs it. There is only setting the initial focus position now. It's simpler to me than the old method, though the actual step size you get is still a mystery. (to me at least) I appreciate that ML developers don't know what lens a person might be using, or what initial focus distance is, and they probably don't want to do the effort to figure that all out for you. Though I think theoretically they could for some set of lenses. I am reminded of the famous quote, "Everything should be made as simple as possible, but no simpler." That sort of interface is great if your main worry is that you might otherwise miss focus by a little bit, so you'd like to have some variation to choose between. But it's not so great for shooting deep stacks, as you've noticed. To be frank, I have the feeling that such interfaces are designed by people who don't use focus stacking very much and somehow got the wrong idea of what's required. Does the interface at least provide some method of previewing the limits, so you can iterate to set the center and count? When you're driving the focus motor, the actual step size is always a mystery until it's been measured and modeled. As a matter of practice, the usual approach is to use experiment to find a combination of aperture and step size that work well together, then write that down so you can reuse the info as needed. Certainly appropriate combinations could be tabulated and interpolated in the firmware. But if the developers don't even understand about the importance of setting front/back limits, then I'd be surprised if they did something elegant with step size. That's a known issue. We've gradually figured out, it happens occasionally when some web indexing or corporate anti-malware engine hammers on us too intensely. It's usually a short-lasting condition. In rare cases where it persists, we take manual action to block the offending engine. The problem occurs frequently enough to be annoying, but not frequently enough to spend a lot of resources trying to totally prevent it. There is no means to do that I can see. I think this works OK for up to 100 images in a stack. You could do 200 by specifying 100 in front and 100 behind the starting focus point, but then you are stuck with figuring out how many in front to ask for. If you only ask for images behind you can stop it when you get enough. I haven't tried images in front but I assume it will move to the 1st image and shoot from there. Then you might have quite a few focused too close that you have to sit through to complete the stack. Of course if one were to test it all as you suggest then you would know what numbers to use to get what you want. I think it will depend strongly on initial focus distance as well though. With a step size of one I got about 24 images for about a 3 inch stack, so 200 is going to be really deep. Very small steps may not be useful for this lens anyway, and you don't get focus control with microscope objectives so maybe it's not such a limitation for ML anyway. Seems a nice feature for field stacking with the right lenses though. I just realized I think you can just start the stack again and it will pick up where it left off (so long as you don't disturb anything) for another 100 images. It might be a special situation where you want that many images with this lens. Too bad the MP-E does not have autofocus (or any focus for that matter). That would be cool if the step size worked out.